Not every action game involves plugging into a console. 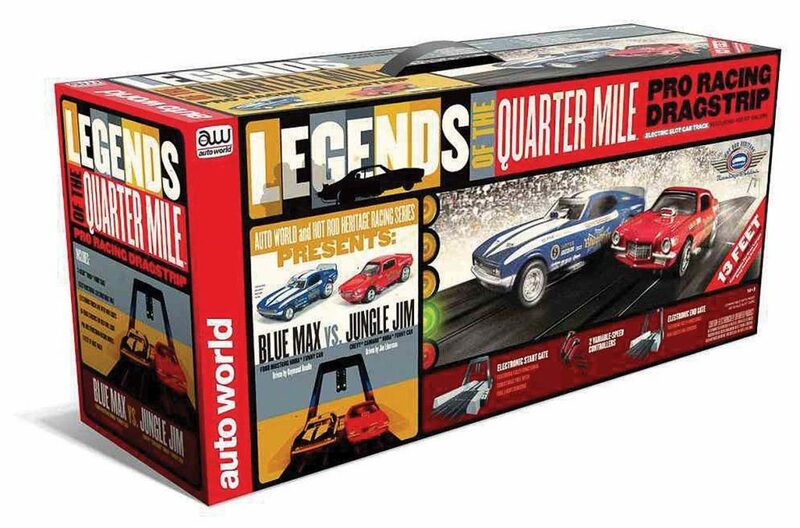 For example, the Legends Quarter Mile Drag Race Track Set (product code: SRS308) requires a 31.5-foot-long straightway (your driveway or similar flat surface will work) and of course a handy wall plug to operate the two electric slot cars that come with the set. As the name implies, the “legends” in this case include a pair of 1:64 scale vintage cars patterned after real 1970s drag-racing machines driven by Don Garlits and Shirley Muldowney. Also included are controllers for each lane, mechanical start/finish gates, guardrails and even a bonus 12-foot-long return lane. The Legends set can be purchased for $120 from www.allenallenmotorspeedwayracing.com.